I vividly remember listening to an episode of “All Things Considered" on NPR about four hijacked planes that crashed in the United States on September 11, 2001. The airspace over the U.S. was immediately closed, and over 200 planes in the air were ordered to land at the nearest airport. Thirty eight airplanes landed in an outdated airport in Gander, Newfoundland, a small island off the eastern most point of Canada. This remarkable story piqued my interest when I learned it was going to be turned into a musical. The book, music and lyrics of “Come From Away" by Irene Sankoff and David Hein was inspired by the bond they saw with New Yorkers during 9/11, as they helped one another during the aftermath. When they heard about the selfless people in Gander comforting 7,000 strangers, this story appealed to them. Especially Hein who had grown up with Newfoundland music. They felt the story they wanted to tell should incorporate the island’s Irish, English and Cornish musical traditions and become a 100 minute song and dance storytelling show. When Sankoff and Hein traveled to Gander during the 10th anniversary on September 2011, they listened to the stories from many of the 7,000 airline passengers. These souls made a pilgrimage to Gander to commemorate the kindness and generosity they received from nurturing strangers. The Canadians called them “Come-From-Aways” (people from beyond the island), hence the title. After great success on Broadway, the first National Tour opened on Wednesday, November 28 at the Center Theatre Group/ Ahmanson Theatre. What makes this show run at an electric and entertaining pace is Tony award winning Christopher Ashley’s direction, Kelly Devine’s musical staging with a group of talented musicians, and a company of 12 versatile actors who can sing and dance. Each play multiple characters seamlessly from the passengers on airplanes, to the residents of Gander. At times it felt there were three times the number of actors onstage, because each character was strong and distinctive. One of my favorites was Nick Duckart (Kevin J, Ali and others) in his portrayal of Egyptian and Muslim immigrant Ali, and a gay New Yorker named Kevin. Both characters had individual accents, wardrobe and gait. Their fears and raw vulnerability were highlighted in each scene. Beowulf Boritt’s set is open with just 16 tree trunks framing the wings. The band is near these trees while playing 15 of the uplifting songs, led by conductor Cynthia Kortman Westphal on the keyboard, accordion, and harmonium. Just like the actors playing multiple characters, the musicians are versatile too. Isaac Anderson plays a whistle, Irish flute and Uilleann pipes; Kiana June Weber plays the fiddle, while Adam Stoler plays a wicked electric and acoustic guitar. Matt Wong not only plays acoustic guitar, but also mandolins and bouzouki. Max Calkin plays Bodhran and percussion, while Ben Morrow also plays percussion and drums. Music begins as all the actors start tapping their feet while singing the first song “Welcome to the Rock.” From this first lively dance number to the end, the stories of thousands of people captured our attention and hearts. Many are Broadway and National stars including Kevin Carolan (Disney’s “Newsies”), Harter Clingman (“Peter and The Starcatcher”), Chamblee Ferguson, Becky Gulsvig (“School of Rock the Musical”), Julie Johnson (“Memphis”), Christine Toy Johnson (“The Music Man”), James Earl Jones II (“The Gershwin’s Porgy and Bess”), Megan McGinnis (“Les Misérables”), Andrew Samonsky (“South Pacific”), Danielle K. Thomas (“Avenue Q”), Emily Walton (“August: Osage County”). Gander is a small place with the wildest weather and “it’s the farthest spot on North America to Disneyland.” As residents share where they were when the news of 9/11 came across the television and radio channels, the stomping of feet and singing introduces the audience to the town Mayor, kind-hearted SPCA volunteer Bonnie (Megan McGinnis) and residents hanging out Canada’s quick service restaurant Tim Horton’s. Canadians in the audience chuckled when the Tim Horton sign appeared. We learn in “38 Planes” and “Me and the Sky” that one of the jets to land in Gander was an American Airlines airplane en route from Paris to Dallas, Texas. Captain Beverly Bass (Becky Gulsvig) with her crew and passengers were captive inside the plane for almost 28 hours until the FAA allowed them to disembark. All U.S. planes were treated as bomb threats. Beverly was the first female Captain at American Airlines in 1986. During the song “28 Hours/Wherever We Are” the anxiety ridden Kevin (Nick Duckart) illuminates the stress of over 200 passengers sitting idle for such a long time. Looking out their seat window they noticed police cars, armed guards and the army outside. A touching and moving song, “Blankets and Bedding” demonstrates the frantic pace the people of Gander worked together to prepare community buildings into a shelters and make sure these agitated people felt welcomed. Once they stepped off the plane, the town realized that the passengers are from all over the world, speak different languages and practice different religions. Cultures clashed at times and nerves ran high, but the uneasiness these people felt at the beginning, turned into trust, love and friendship by the end. The town doubled in population during the five days that U.S. air space was closed. A light hearted and fun scene was during the song “Costume Party” when passengers try on clothing collected by the townspeople to refresh their smelly attire. The audience teared up as Hannah (golden voice Danielle K. Thomas) sang “I Am Here” and laughed with Bob (James Earl Jones II) as he took barbecues from various homes for a big cookout. Another moving number was “Prayer” with charismatic Kevin T (Andrew Samonsky and others) illuminating a space to reflect and practice their Christianity, Muslim, Hindu and other religious beliefs. 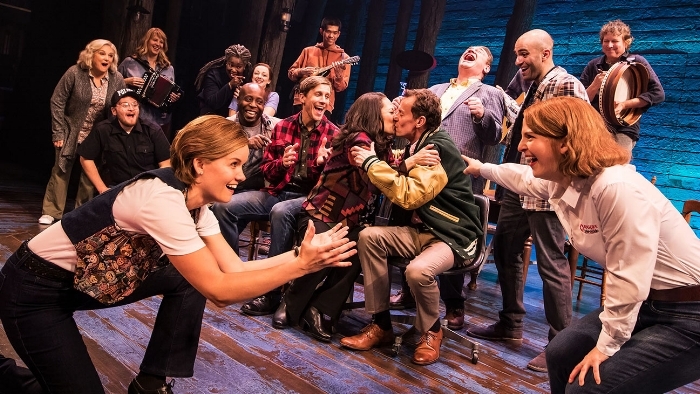 “Come From Away” will have you walking out of the theatre with a warm heart and hope that we as a nation, even in the worst times, can come together to selflessly love thy neighbor no matter what country, religion or gender. Tuesday through Friday at 8 p.m., Saturday at 2 and 8 p.m. and Sunday at 1 and 6:30 p.m.
Ahmanson Theatre is located at 135 N. Grand Avenue in Downtown L.A. 90012.